It was a nervous time for film photography when digital cameras took off in the 1990s, and seemed set to take over entirely. But with some help from Vladimir Putin - then deputy mayor of St Petersburg - the little Lomo camera became a retro cult classic, and showed film had a bright future. In 1991, a group of Austrian art students on a trip to nearby Prague found, in a photographic shop, a curious little camera. Black, compact and heavy, the camera was rudimentary. The lens was protected by a sliding cover. Loading, focusing and rewinding were all done by hand. After developing the shots, the students found it produced pictures unlike anything they had seen before. The colours were rich and saturated, an effect heightened by the lens's tendency to darken the corners of the frame to create a tunnel-like vignetting effect, and there were dramatic contrasts between light and dark. The Austrians were hooked, and so were their friends when they showed them the results back home in Vienna. The little camera was the Lomo LC-A - Lomo Kompact Automat, built in Soviet-era Leningrad by Leningrad Optics and Mechanics Association (Lomo) - and very soon a craze was born. It was an analogue Instagram in the days before digital photography. Then, in the mid-90s, having exhausted the supply of left-over Lomos gathering dust in Budapest, Bucharest or East Berlin, they went to the camera's manufacturers - still making optics in St Petersburg - and persuaded them to restart production. The negotiations were helped along by the support of the city's then deputy mayor, Vladimir Putin. On Friday 23 November, Lomography is celebrating its 20th anniversary, by starting a series of parties in some of its 36 stores around the world. The movement's art-school ethos is enshrined in 10 golden rules of Lomography, with an emphasis on spontaneity and experimentation - and a rejection of some of photography's basic laws of composition and focusing. It's common for Lomographers to "cross-process" slide film in negative chemicals, which gives an additional boost to colours and contrast, and to play around with colour filters. The original LC-A has been joined by a range of other cameras, some of which are redesigns of the LC-A, but there are also various models of plastic-lensed "toy" cameras, the Sprocket Rocket, which exposes the film around the winding sprockets, and the Spinner, which revolves as it shoots, taking a 360-degree picture. The most recent addition is a retro medium-format bellows camera, the Belair. As former giants like Kodak and Agfa's film ranges have dwindled, Lomography has also rescued old emulsions from extinction or created new ones. There has been much speculation that Lomography may buy the rights to some of Kodak's extinct emulsions if the photography giant - now in bankruptcy protection and likely to focus in future on its printer business - sells off its film division. It's not the biggest player in the film market, but it's the most vibrant, and it's been there all along - unlike Ilford, which went under, and was resurrected. Photographer Toby Mason from Brighton in the UK, says the foibles of Lomography - the things that conventional photographers might regard as its aberrations - are what make it attractive. Photography all too often becomes a sterile, technical pursuit, in his view. "I can't help feeling that the emphasis is more on the quality (and cost) of the equipment, the zoom lens and the rest of the kit as well as the photographer's ability to manipulate an image in Photoshop or Lightroom, than the act of taking photographs that evoke a sense of feeling," he says. "The world around us is not air-brushed, and we would all do well to marvel at the quirks of everyday scenes and chance sightings. I like to use film because I feel this gives photographs more character, in the same way that while listening to music on vinyl isn't as 'perfect' as CD or digital, it does have more soul." Photographer Kevin Meredith was attracted to the LC-A because he wanted a camera that would fit into his pocket "and take decent pictures at night". 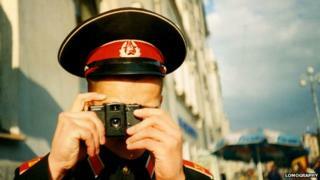 He bought his first Lomo camera in the late 1990s, before compact digital cameras came into existence. "A decent 35mm film compact could cost upwards of £300 so £90 for an LCA was a steal," he says. His affinity with the Lomo kickstarted his career as a teacher and writer. "The reason why I developed as photographer is that I had this little camera on me all times, which meant I never missed a photo opportunity. Also I shot with an LC-A using cross-processing - these images can look unique which made my photographs stand out from the crowd." The rise of digital photography is widely supposed to have made film photography redundant. Rather than burn through rolls of film, digital photographers can instantly review and tweak their pics. Lomo cameras have also been derided by some as a fashion accessory, bought by people more concerned with trends than any real love for the art of photography. Lomography has its celebrity fans, too, from Lord of the Rings actor Elijah Wood to garage rock band The White Stripes. It has even bled into the wedding photography market. British photographer Emma Case uses Lomography cameras - including toy cameras - for her wedding shoots. "I mainly shoot digital for weddings and have a collection of Lomography cameras that get used at certain parts of the day. I tend to use my [plastic lens] Diana, my LCA+ and a Polaroid for the more creative parts such as couple portraits… you tend to have more time to play, find the right light." Lomography's devotees seem unconcerned with the rise of digital Lomo imitators such as Instagram and Hipstamatic. "When all around us other people are looking for an instant fix, instant results, and images that you just take, look at and delete in a flash, then Lomography is doing something great by going against the grain," says Mason. There is also one kind of excitement that most digital photographers have forgotten, or will never experience - the wait for the film to come back from the lab.